The box resembles that of another GW starter kit, the Dark Vengeance. A semi-sturdy cardboard box covered by the plastic wrappings. I took out the wrapping before writing the review of course. Pretty large and we’ll soon see why. Opening the lid we see the collection of sprues housing all the miniatures. That is a lot of minis for such a box! The sides of the box underneath has a lot of artwork depicting the models inside, the Blood Angels units have Terminators and Death Company, The Tyranids get the Hivefleet Leviathan artwork. The backside has a nice intro to the Shield of Baal campaign as well as the war game that is Warhammer 40k. 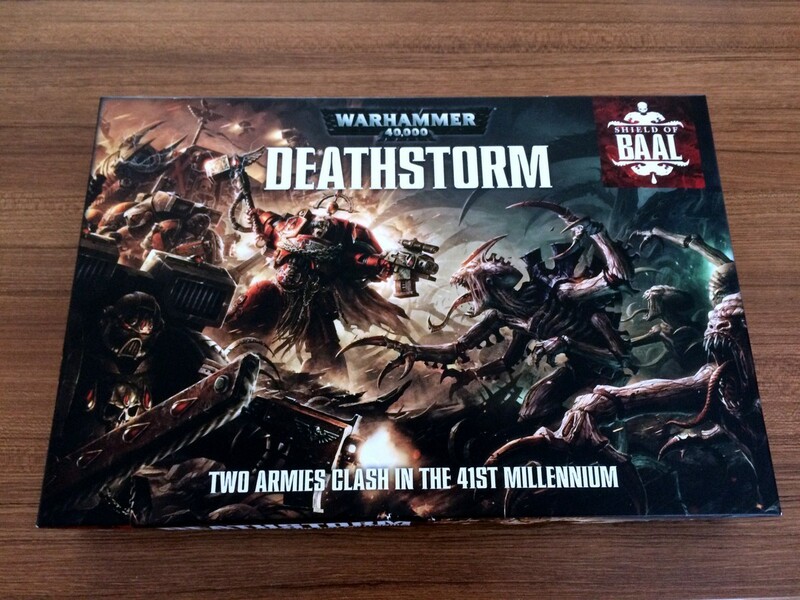 On the bottom we get the miniature rulebook, the Shield of Baal: Deathstorm campaign supplement, assembly instructions and the bases for the minis. The minis each get their own manuals. With the various parts in all the sprues, this is a very welcome addition. The campaign booklet sports both great artwork and useful information for gamers and hobbyists alike. Similar to the Dark Vengeance set the box includes the smaller version of the rulebook. My copy got damaged on the way it seems, but not as much as to deem it useless. Here’s the set of the much debated bases. 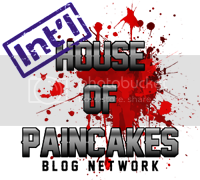 Finally, a transfer sheet for the Blood Angels Death Company. The bases that come with this kit is of different standards compared to the other sets on sale at the moment. The new bases are for the Tyranid warriors (50mm instead of 40mm), the Death Company marines (30mm instead of 25mm) and the larger oval bases for the Broodlord and the Carnifex. While this is pretty uninteresting to me as a hobbyist I hear from the gaming community that this may be a new standard for GW. We’ll see how things develop with the new boxed sets, won’t we? On a single sprue we get the Dreadnought. … and their weapons and banners on another sprue. Lastly we get the Death company marines, which is immensely populated with all sorts of bits. The Dreadnought sprue has three variants available for building, not much is left when one model is finished so I think kitbashing will be difficult if you’re not actively collecting Blood Angels (like I do). Of course the weapon options are nice for those who’re interested in magnetizing them and using in games. The Terminator sprue leaves out arms for 2 Terminators once assembled along with an alternate chest for a sergeant, some banners, relics and Terminator honors. The banner has sculpted detail so it will be easier for me to paint! The Death company sprue is very densely populated and houses 7 different head and shoulder options for the marines. There seems to be an option to outfit them with power packs instead of jump packs, but I don’t think that will be my choice for the kit. In total we get 1 Dreadnought, 5 Terminators and 5 Death Company marines for the Blood Angels. Tyranid warrior sprues house the most bits among the Tyranid side. The Genestealer sprues are pretty generic. They do however include a different piece which I couldn’t place with the other kits. Genestealers also have two sprues of their own. The Carnifex sprue is the simplest looking one. The choice of melee or ranged weapons is on separate sprues. The Carnifex has a total of six head options! That was kind of amazing to me considering there will be so much leftover pieces once the model is assembled. More power to bitz collectors I suppose. There’s also a variety of mêlée and ranged weapon options for the creature, once again leaving a lot of bitz for those interested. The Genestealers come on two sprues and house a growth-like additional model which I at this time assume is used either as a marker for the campaign or on the larger creatures’ bases. In either case, extra pieces is nice and leaves lots of room for customization. 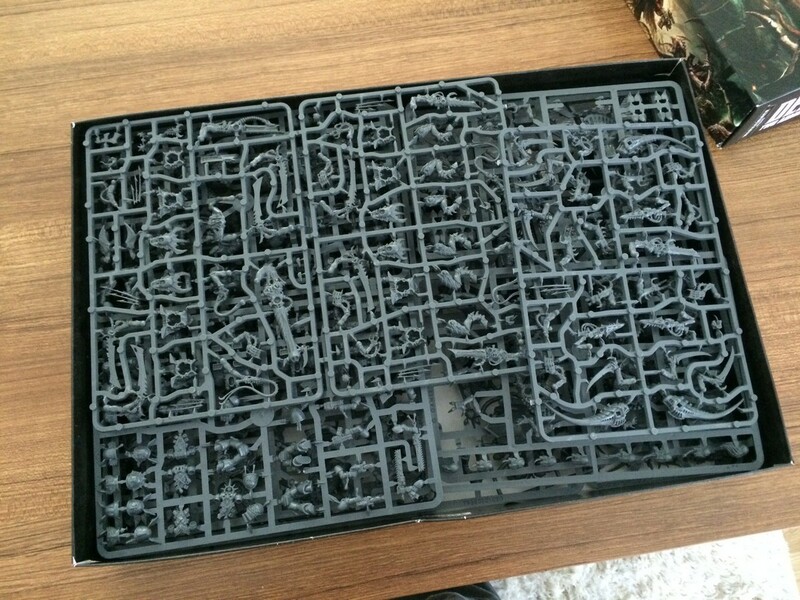 Both sprues are identical, which leaves 16 Genestealer heads on 8 bodies to pick from. The Tyranid warrior sprue is the Death Company equivalent for the Tyranids: lots of mêlée and ranged options but limited in head choices. The Tyranid swarm hosts 1 Carnifex, 3 Tyranid Warriors and 8 Genestealers, totaling 12 models. So that leaves 2 more minis which I wanted to save for last: the unique commanders. Spawn of Cryptus on the left, the Blood Angels commander Captain Karlaen on the right. A close-up for Captain Karlaen reveals lots of sculpted details: chains, tilting shield and scrolls on the armor. The right arm and the chestpiece take the cake in details. The face has visible sculpted vampire fangs. Sweet. The Spawn gets a custom base to stand on, which makes it quite imposing next to the larger Tyranid creatures. With the 2 commanders for each side we get a total of 25 miniatures for the whole box. A very good deal considering the £75 price-tag. In addition to the fact that each miniature costs £3 on their own you get extra items like the campaign supplement and the small rulebook which would fetch nice prices of their own if eBay is your thing. I’ll be holding on to those as they have lots of nice artwork to get inspired by! All in all I found the new starter set to be both quite a bargain and a treasure trove of miniature goodness so I would recommend it to anyone who considers purchasing it. Well I guess I earned this comment after boisterously setting myself the “no more kits” goal and certainly not even giving an effort to stick to it. But you are most certainly right, there’s so many pieces of sprue in the house now that my wife is looking at me sternly. That’s why I’m probably not getting anything miniature related this holiday season! Good to see you here again, and have a great Christmas!